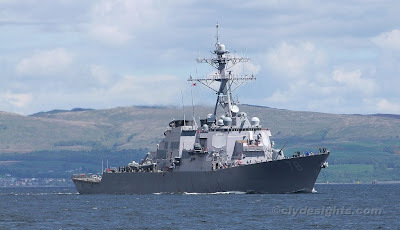 Seen departing from the Clyde on Friday afternoon, the 'Arleigh Burke' class destroyer PORTER had spent the previous night alongside the lead ship of the class at Faslane at the conclusion of the Joint Warrior exercise. PORTER had, like her sister, taken part in a variety of scenarios to prepare her for future deployment this summer on the African coast. These included surface, anti-submarine, and air defense exercises.